While recently shopping for a new pair of jeans at my favorite department store, I encountered something I’ve never seen before: a small, standalone 5-inch LCD monitor that served as a shelving price tag; there was no power cable or connections. Forgetting about the jeans, I inspected the signs, which were located throughout the store, and wondered how they worked. There had to be a wireless network, but how exactly did it operate? The store manager gave me a brief explanation of the system, without giving away trade secrets, but my curiosity was not satisfied. After much research, I found out the company that designed and manufactures this sign system is Altierre, located in San Jose, Calif. Eventually, I was directed to Sunit Saxena, the CEO. On a conference call, Saxena explained that the goal of the Altierre system is to replicate the Internet experience for retail stores. The Internet, he explained, has all of the key information needed to make a purchase. In contrast, signage on the retail floor is spotty and usually consists of a small paper tag near the product with the price, model number and maybe a feature or two. Many times, the information or price is incorrect. The Altierre system addresses the physical challenges of getting dynamic information to the retail floor. The advanced system that was designed from the ground up is completely wireless; wiring a store on this magnitude would be cost prohibitive. The monitors also are battery-powered. They use standard watch batteries, which last for years. The extended-battery life operates with an advanced power-harvesting chip. Though the screens are currently black-and-white LCDs, color is on the way. They communicate through strategically placed transmitters in the ceiling. Only one or two transmitters are needed for a large retail store with thousands of signs. The wireless system can communicate with thousands of devices simultaneously, without any delay or overload. “We had to design a special wireless communication system because standard Wi-Fi systems are only capable of communicating with up to 256 clients, which is not enough for most retail applications,” Saxena said. Each sign has its own unique address and is programed by a handheld device. The store clerk first scans the UPC code on the item and transmits the information to the sign. The content can be changed locally or globally. Content can be as simple as product model and price, or it can add animation and motion to attract attention. Once a price is changed in the computer system, it is automatically updated on the sign, within seconds. This feature is a game changer. The biggest obstacle to placing a digital signage system in a retail store today is the availability of brand assets. Having a library of content easily accessible and tied to POS solves that problem. Since content has to be loaded into the system for inventory purposes anyway, using the existing content for digital signage is convenient and creates an economy of scale. Maintaining basic product information in the database is required for everyday business purposes. Using that same data for digital signage gives that content additional usage without adding expense. It also opens up endless possibilities for the future. 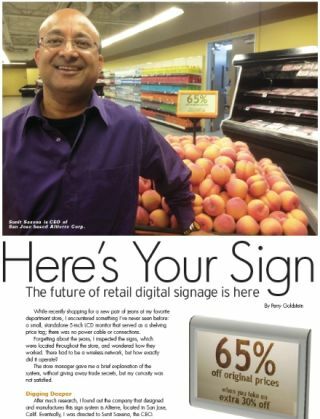 According to Saxena, the system can be installed and operational within a couple of hours, and thousands of signs can be activated in a within a day. The only wiring that is needed is Ethernet cabling to the wireless transmitters in the ceiling, which connect to the network. The system is green as well. By powering the transmitters by PoE, very little electricity is required. Since the signs are run by long-life batteries, no electricity is needed, and very little hazardous waste is generated. The screens also last a very long time. Most of all, there is no need for paper, which saves trees and eliminates waste. The system can operate as a standalone system or integrate into a larger ecosystem, tying into many popular content management systems. Saxena says this is just the start. Altierre is enhancing its sign system so in the future it can run large flat screens that display full, color-rich content. Saxena founded Altierre in 2002. After an initial test installation in a grocery store, they received their largest installation to date from Kohl’s Department Stores. After a successful test in select stores nationwide, Kohl’s decided to roll out the system chain-wide. There are other large-scale projects in the early stages of regional testing, including some in nationally recognized grocery stores, drug stores and department stores, and even a large grocery store chain in France. Saxena is fully aware about the current state of retail brick-and-mortar stores. “E-tailers are winning the war right now,” he said. “Traditional retail stores are going to have to improve the experience to win back the customers. The way to do that is by giving more information to the customer at the point of sale. Digital signage in general, and Altierre signs specifically are the tool to do just that. Every possible obstacle to placing our system has been addressed”. Saxena’s goal is to replicate the Google search sidebar experience, which is to deliver basic information in a clean, easy-to-read manner, at the point of sale. On your next shopping trip, pay attention to the signage in the store. You are sure to encounter these signs in your favorite stores.